Mainers for Health Care rally outside the State House prior to Gov. Paul LePage's State of the State address in February. 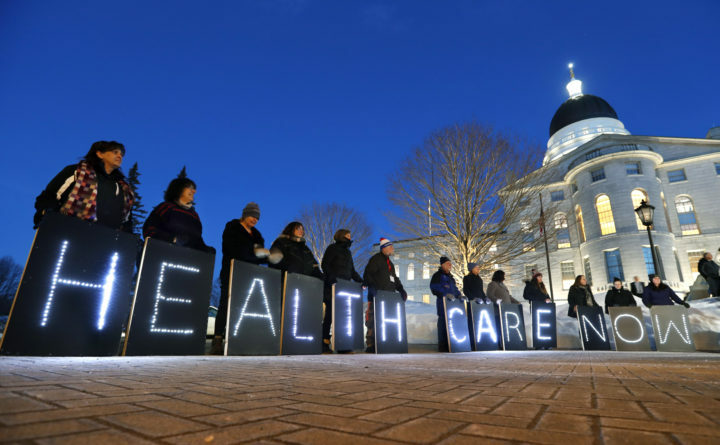 The coalition that supported the successful Yes on 2 campaign to expand Medicaid in 2017 say LePage and his allies in the Legislature are trying to block Medicaid expansion, which is now state law. A judge ordered the expansion on Monday. AUGUSTA, Maine — A Maine judge on Monday ordered Gov. Paul LePage’s administration to begin implementing voter-approved Medicaid expansion in a massive victory for advocates and a blow to the governor on a core fight of his tenure after the state ignored a key deadline. In a 13-page decision, Superior Court Justice Michaela Murphy cited the Maine Department of Health and Human Services’ “complete failure to act” on part of the law requiring the state to file a plan to expand Medicaid. She ordered state officials to file that plan within a week. Advocates for Medicaid expansion sued the LePage administration in late April after the state missed an April 3 deadline to send a plan — a simple document — to the U.S. Department of Health and Human Services on how it would cover an estimated 70,000 more Mainers with incomes between 101 percent and 138 percent of the federal poverty level. The Republican governor vetoed past efforts to expand Medicaid five times. He kept that tack after 59 percent of Maine voters approved it in last year’s election, repeatedly saying he wouldn’t implement it unless lawmakers funded it at his administration’s disputed cost estimate and without raising taxes or raiding state surpluses. Lawyers for the state argued that LePage couldn’t implement a law that hasn’t been funded by the Legislature. While startup funding has been a priority for legislative Democrats, it is one of many issues held up in a partisan State House feud over a larger spending package. Robyn Merrill, executive director of the progressive Maine Equal Justice Partners, which led the lawsuit on behalf of people who would be covered, said in a statement that voters “did not make a request at the ballot, they passed a law, and laws are not optional.” A LePage spokeswoman said the administration is reviewing the decision. Under the law, the state is supposed to start covering newly eligible Mainers by July 2. However, Democrats have proposed a $10.4 million bill to fund more than 100 state jobs related to expansion and Murphy’s ruling did not weigh in on funding of the law. That could be the new fight over expansion if the ruling stands.